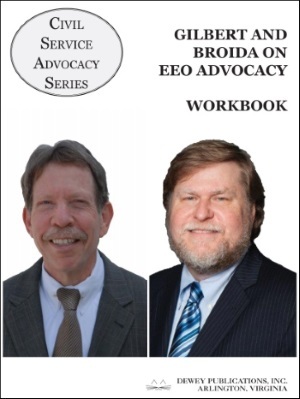 Gilbert & Broida on EEO Advocacy - Dewey Publications Inc.
Gary Gilbert and Peter Broida present a video seminar for agency practitioners on the practical points of representation of federal agencies in the EEO process. They discuss the proper role of counsel during the EEO counseling and investigation process; discovery; motion practice; effective summary judgment submissions; approaches to settlement; hearing preparation, practice, and procedure; examination of witnesses; opening and closing statements and briefs; OFO appeals; and interaction with judges, opposing counsel, and pro se complainants. Workbook included.